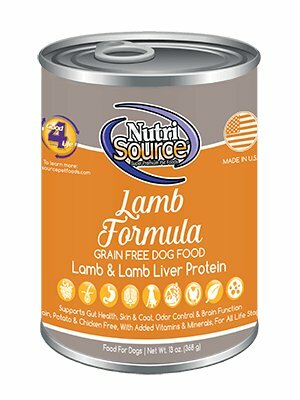 NutriSource® Lamb grain free formula delivers super premium nutrition in a holistically formulated, easy-to-digest pate canned food. We combine pasture raised lamb minced to a fine pate with highly digestible minerals & potent pre-biotics to promote balanced growth and unparalleled immunity and health for your special friend. Health of your best friend is our #1 priority and our unmatched use of Good 4 life supplements guarantees you won't have any runny stool issues and a healthier immune system, we guarantee it. From our family to yours - Health starts here! - family owned means we can make decisions based on what's best for your family pets. Lamb, lamb broth, lamb liver, chickpeas, agar-agar, tricalcium phosphate, potassium chloride, salmon oil, calcium carbonate, salt, choline chloride, sunflower oil, cranberries, kelp, betaine, taurine, zinc proteinate, iron proteinate, brewers dried yeast, yucca schidigera plant extract, selenium yeast, copper proteinate, magnesium oxide, cobalt proteinate, manganese proteinate, ethylenediamine dihydroiodide, vitamin E supplement, thiamine mononitrate, niacin supplement, calcium pantothenate, biotin, vitamin A supplement, riboflavin supplement, vitamin B12 supplement, pyridoxine hydrochloride, vitamin D3 supplement, folic acid. Calorie Content - Metabolizable Energy (calculated): 1,197 kcals per kg, 442 kcals per 13 oz. can.